Lauriol Plaza | Gluten Free D.C.
What I got: Veggie fajitas served with rice, black beans and corn tortillas. This was the best mix of vegetables I’ve ever had with fajitas. Everything was fresh and delicious. And there was SO MUCH food. The photo below doesn’t do this meal justice. (Thanks, mood lighting.) Not pictured: delicious margaritas. Veggie fajitas with beans, rice and corn tortillas. Gluten-free friendliness: Gluten-free options aren’t marked on the menu. (Vegetarian options are marked with a red “V”, though, so it seems like they should be able to do this.) 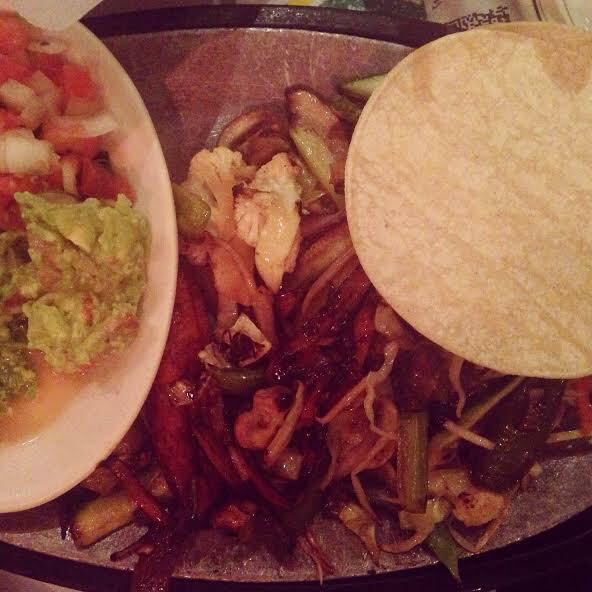 Fajitas with corn tortillas is always a good bet at Mexican restaurants. And there’s usually corn chips and salsa before the meal, too. If you’re looking for something lighter, the menu offers six large salads. There’s also a wide range of chicken and beef options that are gluten-free, like pollo saltado and lomo saltado. Overall vibe: The best thing about Lauriol Plaza is it’s high-end feel featuring an affordable menu. The multi-floor space is beautiful but not too fancy, and the food is incredible but not too pricey. You could go here on a date or with your family from out of town (as I did). At the bottom of 18th Street, this restaurant can get pretty busy. There’s a large an outdoor seating area on the sidewalk, which is the perfect place to sip your margarita while you wait for a table. This entry was posted in Adams Morgan and tagged Adams Morgan, fajitas, GFDC, Gluten-free diet, Gluten-free food, Gluten-free foods, mexican. Bookmark the permalink.